An ambitious blueprint for the future of the Maze Prison site, featuring a sports stadium and a conflict transformation centre, will be unveiled today. The 360-acre plot near Lisburn, Co Antrim, will also feature a cinema, industrial zone, restaurants and parkland. In 1981 IRA hunger striker Bobby Sands became the first of 10 republican hunger strikers to die in the Maze. The focal point of the plans will be a 42,000-seater multi-sports stadium, which could stage football matches as part of the 2012 UK Olympics. The stadium question has generated controversy, with some politicians arguing it should be in Belfast. 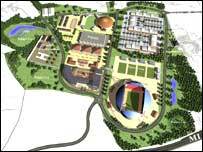 But the British government has warned doubters there is no plan B for the state-of-the-art facility. The conflict transformation centre was critical to ensuring republican backing for the Maze proposals and will see the preservation of the prison’s hospital wing. It is understood the project will also include a 5,000-seat indoor arena, a rural excellence and equestrian zone, featuring an international exhibition centre and showgrounds, and dozens of new homes. A new junction and link road to the site will also be incorporated into the proposals in a bid to overcome reservations about the location of the site. Proposals have also been drafted for a rail link and park-and-ride system close to the stadium, which it is hoped will open in 2010. The Maze consultation panel, which includes representatives from all four main parties, reached agreement on a way forward for the site early last year. Since then planners have been working to fulfil the potential of the government-owned site. # posted by SAOIRSE32 : 12:21 p.m.